The second trend that we saw quite a lot of at Norwegian Open is the discrimination between a tunnel straight ahead and a backside jump close to the tunnel entry. It’s not the first time we’ve encountered this during 2018 and it’s been one of my focuses in training all year. If you’ve been to a handling seminar with me this year, you’ve probably seen it too. There were a few discriminations like this in Nicolas Renaud’s world championship courses for medium dogs. 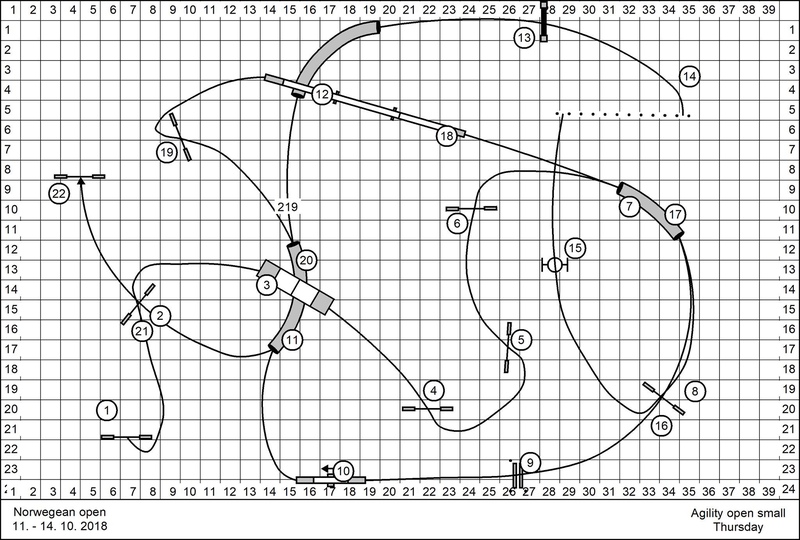 I couldn’t find the course maps from NO that I was thinking of, but here are Renaud’s courses from AWC. 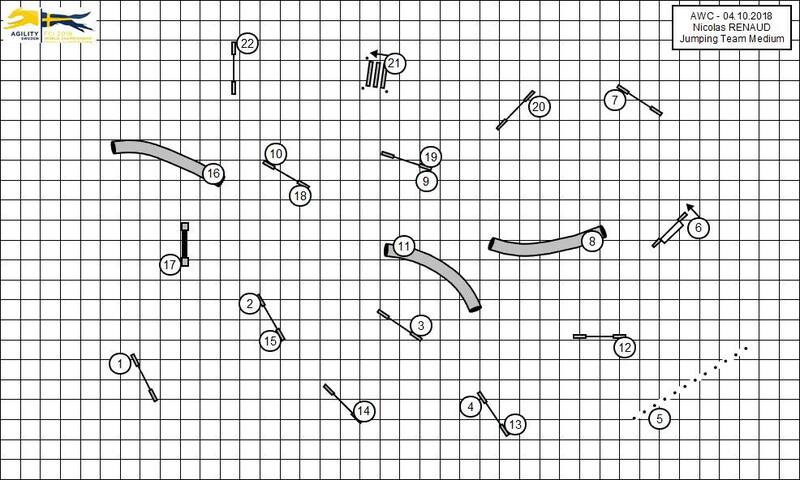 This jumping course started with a discrimination between the backside jump of 3 and tunnel #11. More teams than I would have thought fell in that trap and were eliminated at the beginning of the run. This epic final course for medium dogs had a difficult discrimination after the dogwalk. These types of discriminations are so much more difficult when you have to run fast as a handler and keep moving without showing deceleration. 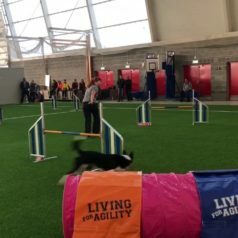 We saw some very impressive handling and verbal control in this course, but also a lot of dogs choosing to go straight into the tunnel. 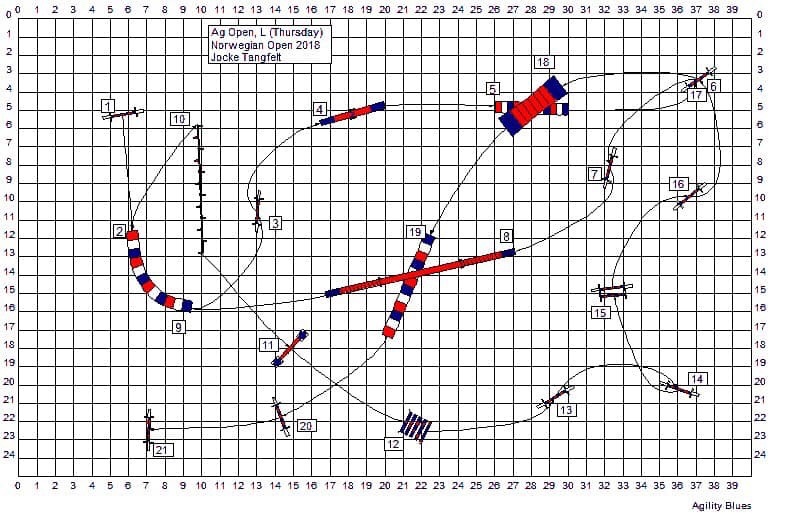 At Norwegian Open, we had a similar sequence in Vittorio Pappavero’s A3 course on Sunday. Unfortunately, I haven’t found the course map. Bud and I nailed the discrimination and handling, but unfortunately, he went back onto the dogwalk when he came out of the tunnel, like many other dogs. This situation from a jumping course gave us some trouble. We were clean in this run but lost a lot of time around this discrimination. Bud was looking at the off-course tunnel and I got scared and slowed down to get him to the correct jump, which put me behind for the next obstacle where I had to pull him off another tunnel and into the weaves because I was behind and not clear. I think we’ve trained on this a lot, but obviously not enough. I tried to cue the backside before Bud even took off at 12, and told him even before that that he wouldn’t be going straight into the tunnel – he needs very early information – but he still looked at it. We’ve done a lot of training on verbal discrimination, but what I think is missing is me running fast towards the tunnel and him coming with more speed than when we’re training on just a few obstacles. This start was tricky! Not so much because of the discrimination at 5 – although I saw quite a few dogs take the tunnel – but because it was difficult to make it to #5 at all as a handler. Rear crossing #4 is very difficult as it turns the dog to the wrong side of #5. Getting two blind crosses in between 2-3 and 3-4 was doable, but difficult to get right as the dog came so fast over the long jump. I decided to run this sequence with dog on left all the way from 1-5 and just stay ahead and be in serpentine position at the landing side of 3. I think it worked really well, but he touched the end of the long jump and was faulted as it fell down. We really need to train (soft) long jumps! How do you feel about this challenge? How do you train it? 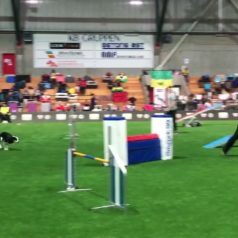 Jocke Tangfelt’s open agility course for large dogs were one of my favorites to run. The ending was tricky for a lot of dogs. They’d either run past #20 or take the wall jump instead. I was confident that Bud would do it nicely, and he did. Partly because he is good at finding jumps and listening to his “jump” cue, and partly because I was placed well. Trusting the A-frame contact means that I could just run and be in a good position for the ending. 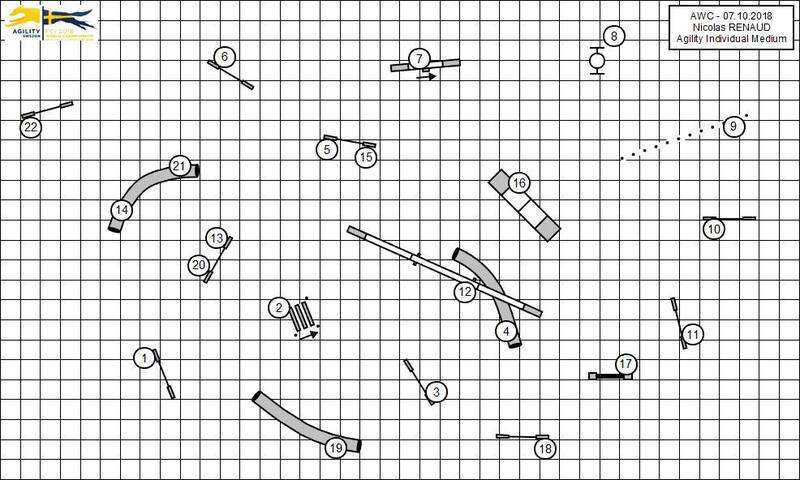 Petr Pupík’s open agility course for large dogs had two instances of layering the dogwalk that caused trouble for dogs and handlers. Many dogs ran past #12 or #21. I’m still very sad that we had so many mistakes in this run that I didn’t get to run it properly. We had a misunderstanding before the weaves (costing time) and then three bars down, which just made me give up at the end so that I sent Bud into the wrong tunnel. I wish I had another chance at it because I really loved the course. Number #12 was very nice though. This third example is also from Petr Pupík, but for small dogs so I didn’t run it. It looks like #13 after the tunnel under the dogwalk is a big challenge and I’d love to run this course as well. 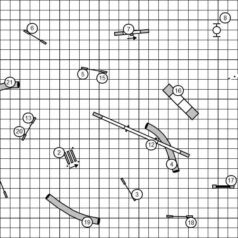 Having an independent seesaw and being able to send the dog through the tunnels from a distance seems to be an advantage, as well as being able to handle 13-14 while staying on the exit side of the weaves. I’d love to see a video of someone executing this nicely! To me, it’s not so much about being able to run as it is a challenge in training and independence. Teaching the dog a good jump cue and making sure it’s working at a distance is one big part of managing these kinds of courses. It’s also important that the dog knows when to come out of a tunnel looking ahead and when to come out looking for the handler. It’s good to get the dog used to that you’re sometimes on the other side of a dogwalk or set of weaves, but mostly it’s about that very basic training that you can do with one tunnel and one jump. We’re back from six days in Norway. It’s been rough finding energy for a huge trial like this right after AWC in Sweden, but I’m so happy that I went. NO is probably the best competition we enter in a year. The organizers go out of their way to find the best judges, use high-quality obstacles and get the best competitors to come. The arena is also one of the very best to run in. It fits four big rings and the footing is perfect for agility. This year we saw competitors from all over the world thanks to it being close to AWC in both time and space. We got to sleep in on Thursday and went on a walk in the forest with our friends. It was a perfect fall day and we had the forest to ourselves, Much needed recovery time for us all. We didn’t have to be in the arena until evening, where we had two open runs. Open classes are unofficial and open to dogs of all levels. These are the classes where you collect points for the big final on Sunday, and there were six of them during NO. We also ran four official classes on Saturday and Sunday (J3 + A3). I’m very pleased with Bud’s and my performance on almost every course. The courses were generally hard and required independence, discrimination, obstacle skills and fast running. We nailed almost every difficult handling part and I felt like he really understood my cues and that I could just run as fast as I can without having to wait and help him. Although we had some bars down – something that has been our big problem in the past 6 months – I felt like he really tried and he jumped some very difficult sequences without touching a single bar. He’s really making progress and I think this year has been a year where he’s been figuring out his jumping. He’s only three years old and has added speed considerably. It’s like we’ve been through every type of knocked bar there is this summer. Sometimes it’s been S-turns, sometimes wraps from the backside, sometimes fast and almost straight lines, sometimes the first jump… This weekend it was the long jump that caused us the most problems. I don’t think he’s been faulted on the long jump before, but he is mostly running in the Swedish large category, so it’s usually shorter. Didn’t have any problems at tryouts or championships before though. This weekend he did have problems. We had faults on the long jump in three runs. The long jump used was the Smart-99 soft long jump, and it’s the first time we’ve tried it. He has jumped the Galican version with no issues. Twice, he just touched the last section and dropped it. Once, he really took off too early and made a mess out of it. I wish I had a soft long jump to train on – partly to get him used to it, but even more to make training more safe for him. I found some common threads in the courses set by some of the worlds most appreciated judges. I’ll get back to that topic later this week. Until then: Can you guess which two common challenges I noted and will write about? Surface. From the moment puppies are born, I think it’s important that they are raised on a good surface. I think it’s really sad to see puppies raised on slippery floors, and I really do think it affects their development. A good surface provides good traction so that the puppy can move about, play and run without slipping. It’s really difficult to find a perfect indoors surface for young puppies – especially if you also want to be able to keep it clean. We try our best with indoors footing for the puppies that we breed, but I still think it’s best if they run and play outdoors on grass as much as possible when growing up. Spring and summer puppies have an obvious advantage here, being able to spend more time outdoors. Fortunately, I’ve rarely had trouble with border collie litters in the winter. They’re definitely okay with playing outdoors in the snow as long as they have a warm place to sleep in when they get tired.If you have slippery floors in your house, I’d definitely suggest that you put some good carpets in before you get a puppy. Place carpets where the puppy moves the most and especially where he’s likely to be in a hurry. And most importantly – make sure that you have a good surface for training. Having reviewed a lot of training videos in our online classes, it’s unfortunately very common for people to train on slippery floors. Please, make sure that you’re always on good footing when playing or training with your dog. I don’t think it’s fair to play or train anything that requires fast movements if the floor is slippery and the dog has to struggle to keep his balance. Free exercise in moderately rough terrain. The best way for a puppy to find strength, balance, and proprioception is by free movement in terrain. When puppies are really small, they have a lot of fun just exploring our garden. I let the puppies we breed spend as much time outdoors as possible from 3-4 weeks of age. With an older puppy, I take them to the forest for exploring and moving about. At 2-4 months of age I usually just stay in roughly the same area and let the puppy just explore, do some recalls and slow walking by my side for short periods of time. When they’re older I let them join the grown-up dogs for walks, but keep an eye on them to make sure they don’t get too tired. I also want to avoid too much running with older dogs, herding other dogs and especially getting tackled by larger dogs. Fortunately, my older dogs are good at keeping a relaxed attitude on our forest walks, so the puppy quickly learns that drill. 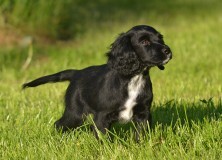 Here’s a really nice video showing some exercises and play done with a puppy in our woods. I think Wilco was about 4 months old when we made this. Learning balanced positions. 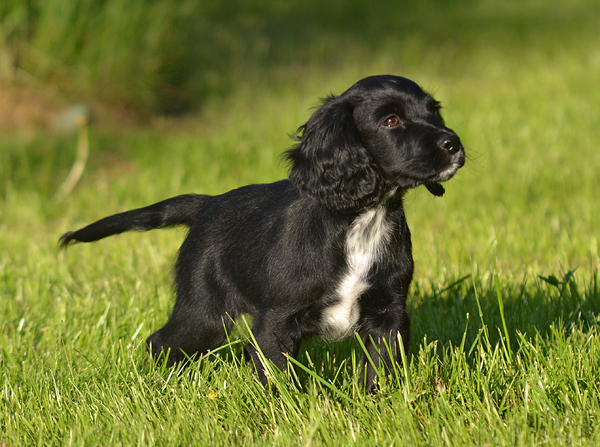 Puppies often lack the muscle that allows for a proper sit, stand or down. They often sit and lie down on one hip because it’s tiring to sit or lie straight for more than a few seconds at a time. In a stand, the puppy will often move feet often and might stick them out to the side as “training wheels” to keep their balance. In addition to slow walking in moderately rough terrain, I think working positions with the puppy is the most efficient way to give them the core strength needed for future exercise. I help the puppy into a good stand, sit or down and just feed them there for a few seconds before releasing. I gradually add duration to the position as well as shaping for the puppy to find the correct position on his own. I don’t see any point in putting the puppy on unstable surfaces like balance discs before he can show me a nice, balanced, and strong position on even ground. When the puppy has developed muscles and technique to hold positions nicely, I’ll introduce some light pressure from my hands pushing to the side at his hips or shoulders so that he needs to push back a little bit to keep the position. I’ll also introduce shifting from one position to another, for example sit to stand so sit with his front feet still. Lifting hind legs to a target (backing up onto something). Rear end awareness with front feet on a platform and hind feet circling around the front. Walking around an object with a bent spine and deliberate paw placements. Not fast, slow and controlled. Stretching out hind legs from a down. Lifting front feet from a sit and a stand. Crawling with hind feet under the body alternating left and right feet going forward. Stepping into and out of a box or over cavalettis. Slow and deliberate once again. I am not afraid to let my puppies use their bodies, join on walks and build muscle. I think it’s probably worse to do too little with a puppy that is going to be an active adult than to do too much. I just try to do more of what I think builds the right muscle and strength for the future, and I don’t like to see any dog work in bad form or do things that they’re not strong enough to handle. What are your thoughts on puppy training?